Winning 3 Digital Signage Awards And What it Means! 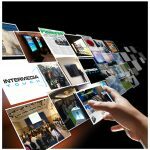 Intermedia Touch receives 3 digital signage awards from the world’s largest and longest running International Conference and Tradeshow dedicated exclusively to digital signage, interactive technology and digital out-of-home networks. The Digital Signage Expo (DSE) awards won by Intermedia Touch include one Gold Award in Education and Healthcare and two Silver Awards in Arts, Entertainment and Recreation. These awards make us proud for not only being one of the winners in a very competitive contest of our industry peers, but also because it shows our clients that when they choose Intermedia Touch, they are choosing the best! At Intermedia Touch we have a team of dedicated and experienced professionals that will provide unwavering commitment to your business needs, while identifying award-winning solutions at a competitive cost and within your established timeframe. Intermedia Touch has grown to be a leader in the digital signage software and hardware industry. We are committed to staying on the fore-front of technology and providing our clients solutions that are trend-setting, dynamic and memorable.